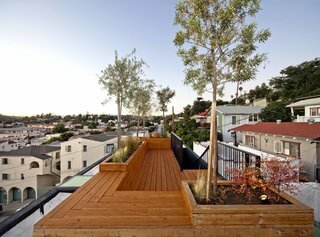 A house in Echo Park makes the most of its narrow lot with open-plan spaces spread out over four levels. 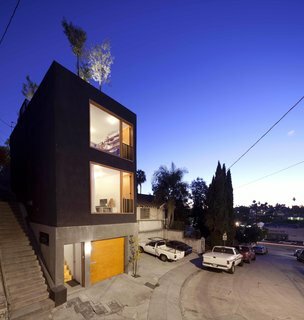 The uncompromising verticality of architect Simon Storey’s black stucco-clad Echo Park home was his response to an unusually tight site; sandwiched between a concrete stairway and another property, it’s a mere 15 feet wide. The workshop at ground level measures less than 200 square feet, but is set up to accommodate any kind of woodworking or welding; when not in use, the architect parks his car inside. 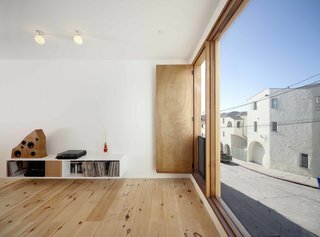 The low-budget, four-level design—comprising a combination garage/workshop, an open-plan living room and kitchen with adjoining patio, a third story with a bathroom and two rooms (one of which functions as Storey’s architecture studio), and a roof terrace—solved the spatial issues in a no-frills way. It wasn’t until after the house was finished THAT Storey realized it offered a different way of living. The first floor contains the living room and kitchen, which opens out onto a petite back garden and an avocado tree. The kitchen is slightly sunken and has a polished concrete floor, which subtly demarcates it from the rest of the space. Materials in the kitchen set the home's material palette, with vertical Douglas fir cabinets and the same 3” x 6” subway tiles that appear in the bathroom for the backsplash. The Fisher & Paykel dishwasher is hidden inside the island: “I wanted the island to look more like a credenza or piece of furniture,” says Storey. "I never expected it to be that interesting, actually," he admits. "It was only after I started living here that I realized 960 square feet is all you need, as long as it’s well thought out and has lots of natural light. It becomes a liberating space to live in, because it’s nothing more than you need." 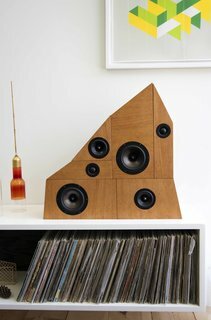 The architect designed and made most of the furniture for the house in the workshop in his garage, including the sofa, coffee table, kitchen lights (which were water-jet cut from a single piece of aluminium), and the speaker stack, which he based on the ramshackle piles of old stereo equipment commonly found in thrift store Hi-fi Corners. 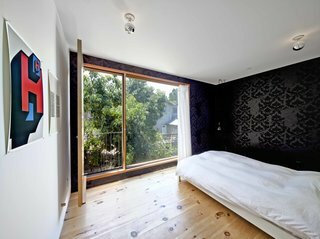 Storey wanted to experiment with something other than conventional windows, so he used a regular door instead, and installed ‘top down/bottom up’ blinds for complete privacy. The second story has two rooms and a bathroom. 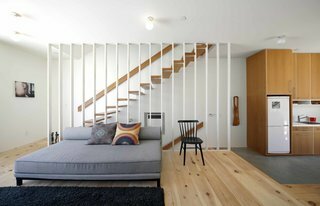 Storey uses the room overlooking the street as his architecture studio, and the quiet back room as a bedroom. Its small balcony is the height of the avocado tree canopy, giving him the sense that he sleeps in a tree. 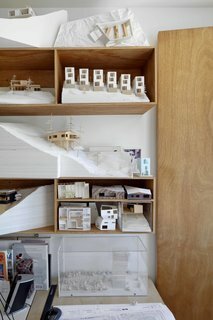 The Anonymous office on the third floor holds a display of Storey’s beloved hand-made basswood and foam-core models. The subway tile-lined bathroom was kept as simple as possible, with Hansgrohe fixtures and cabinets made of vertical-grain Douglas fir above a top-mounted Duravit sink. 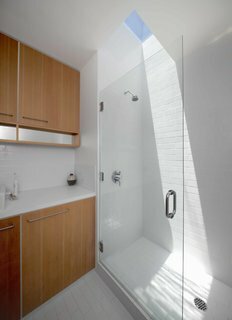 Since installing a window was unfeasible given the bathroom's proximity to other properties, Storey added a skylight over the shower. Planted with three olive trees and drought-resistant shrubs, the roof terrace provides an entertaining space, where Storey often has friends over for drinks and dinner. Storey made the deck out of clear-coated Douglas fir to save costs; it also echoes the cabinets inside, providing visual continuity. 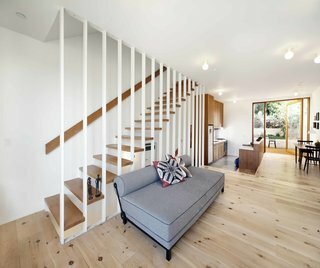 “[I wanted] to keep the variety of wood species you use to a minimum,” says Storey.